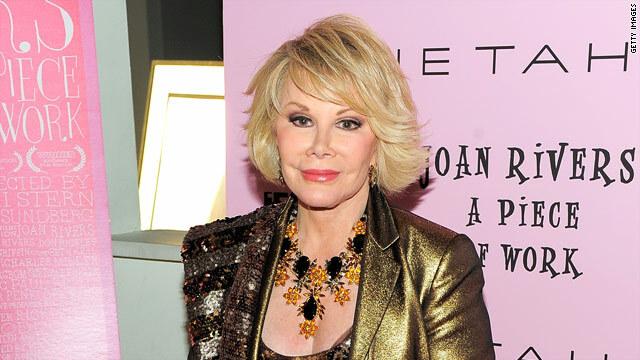 Is Joan Rivers the new Betty White? After this week's release of "Joan Rivers: A Piece of Work," Rivers is poised to become the Next Belated Big Thing. (The Frisky) -- Soon after Betty White hosted "Saturday Night Live," I remember asking my friend Nate, a fellow "Golden Girls" fanatic, what he thought of all the fuss around White's meteoric comeback. He rolled his eyes, shrugged, and said, "It's just weird that everybody's finally come around to realizing that Betty White is amazing. Where have they been?" He was right: the recent trend of people catching on to the fact that Betty White is terrific felt patronizing, and not just because most were astonished that an adorable old lady could land a joke better than most "SNL" hosts one-third her age (I'm talking about you, January Jones); it was the belated appreciation of White's fabulousness that made all of us look even sillier. And now, there's Joan Rivers. Rivers, younger than White by over a decade, has been working steadily since the 1950s, and, after this week's release of a great new documentary about her life, "Joan Rivers: A Piece of Work," she is poised to become the Next Belated Big Thing -- for those who needed 60 years to catch on to the fact that she is wonderful. Unlike Betty White, Rivers didn't have the benefit of starring in a series of beloved television shows, nor did she play characters as affable, matronly, or warmly dotty. Rivers honed her act as a stand-up in the 1960s, when few other women had the guts to talk about not being desired by men on stage or joke about women who were flying to Puerto Rico for illegal abortions on "The Ed Sullivan Show." Since then, she's worked consistently -- if one seeks out her entry on Wikipedia, you can't find more than three years in a row where she hasn't had a TV show. This is because Rivers, who defines happiness as a full appointment book, doesn't have the luxury of turning down projects that aren't classy, or cushy, or critically celebrated; she'll sell her jewelry on QVC; she'll do commercials and perform on a cruise ship. She would wake up early, shoot an episode of her own TV show, or do a guest spot on another one, wrap for the day, then get downtown in time to do her weekly stand-up show at the Westbeth Theater. Joan Rivers loves to work, and she'll stop only when she's dead. So why did it take so long for audiences to respect not just her work ethic, but to realize how talented she is? Based on the reactions so far to her documentary film "A Piece of Work," it seems that what people find most shocking is that she is actually one of the funniest -- and edgiest -- in the comedy biz. David Edelstein, in New York magazine, remarked how, after watching her stand-up in the film, he was "ready to be her slave," and added, "I never knew she worked this blue, that she had this much Lenny Bruce in her." A lot of the delayed appreciation for Joan Rivers has to do with the contempt familiarity breeds. She's never left our sights, and even appeared more and more on our TV screen (winning "Celebrity Apprentice" last year) over the years. And, why should she leave showbiz? Her act is as resilient as her energy level, which, at 77, is enviable. But, like anything else in comedy, Rivers' comeback is also about timing. As Rivers' agent says in the film, Joan knows that in order to get hit by lightning, you have to stand in the rain. And after 60 years of getting soaking wet, Rivers is about to get struck again where she stands -- feet planted firmly, and not going anywhere.